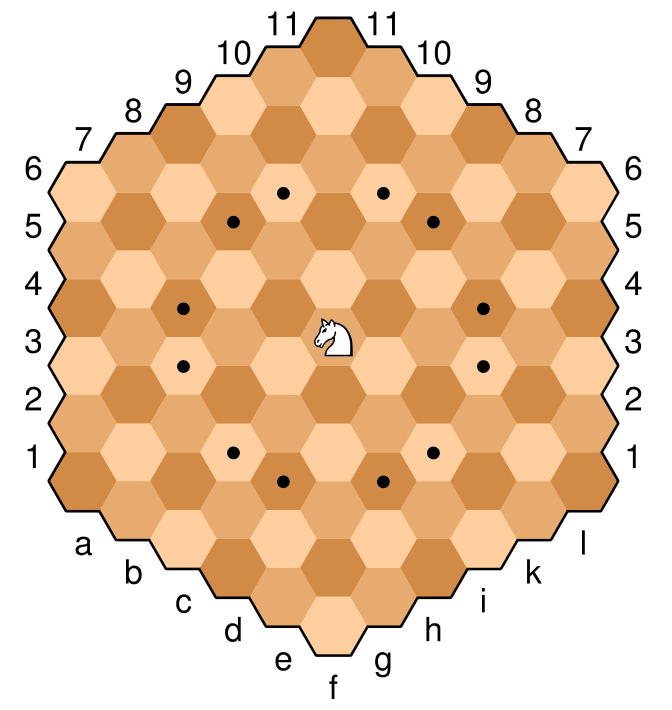 Hexagonal chess describes a family of chess variants played on a board where the cells are hexagons instead of the traditional squares. There are many such variants; in this challenge we'll be focusing on Gliński's variant, which is the most common. Here is an example picture of the board, with the knight on the center cell. The cells marked with a dot are the legal moves of this particular knight. The knight moves in a similar fashion to "normal" chess, two-down-and-one-over. In hexagonal chess terms, it's an orthogonal move (across an edge), then a diagonal move in the same direction (the closest move to the same color). For example with the knight below, an orthogonal move "up" to the light brown is then accompanied by a diagonal move "up and right" or "up and left" to the nearest light brown. A single input giving the starting cell of our knight. This can be as a single string "b6", as two strings, "b", "6", etc., in any convenient format. The input letters can be uppercase or lowercase -- your choice. A list of the valid moves that a knight on that location can make. This can be as an array of strings, a single string with an unambiguous and consistent delimiter, separate strings by newlines, etc., whatever is most convenient. The output does not necessarily need to be in sorted order, and can be in either uppercase or lowercase -- your choice. Assume no other pieces are on the board or interfere with the moves. We're focusing on just the knight. Takes the file F as a character and the rank R as an integer in currying syntax (F)(R). Returns an array of strings. We apply each of them to the source coordinates (x, y) and get a list of target coordinates (X, Y). We should also verify that X is in [0 .. 10]. This is not done explicitly because s[X] is undefined if it's not, which eventually results in a falsy value that gets filtered out. Finally the valid target coordinates are converted back to hexagonal chess coordinates, using the inverse of the formulas described at step #1. I'm using a coordinate system that looks like a..f and 1..6 on the left side, extended without bending, with letters replaced with numbers, and changed to be 0-based (b3→[1 2], g1→[6 1], k3→[9 6]). 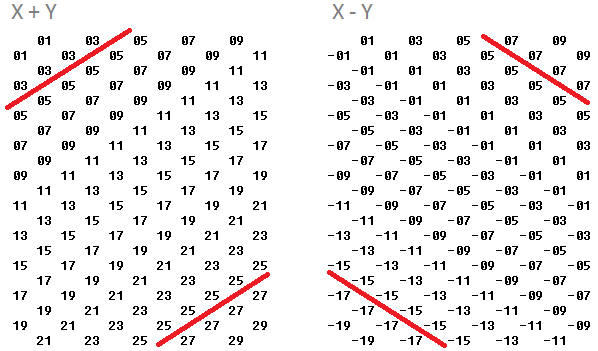 The relative moves in this system are [1 3], [2 -1], [2 3] and their reflections (negative and swapped, e.g. [1 3] → [-1 -3], [3 1], [-3 -1]). A resulting [x y] position is valid iff [x y z] ⊂ [0 1 .. 10] where z=x-y+5. An anonymous function called with two strings for the file and rank; returns a list of strings. Not the answer you're looking for? Browse other questions tagged code-golf chess hexagonal-grid or ask your own question. What are my chess moves?